These lava bead bracelets are handmade by Rosalie Blanza, a single mom in the Philippines. 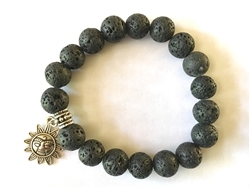 Lava stones have a trendy look and are also fabulous for applying a few drops of essential oil to each bead as a way to carry your favorite oils with you throughout the day. Each bracelet comes with a card that explains Elevita's mission and tells Rosalie's story.